Running for president may have been the worst thing for Texas Gov. Rick Perry‘s career. Not only did he fail to ignite passion in states like Iowa and New Hampshire, but it also hurt his popularity in his home state. An article on Slate.com cites recent polling from the Dallas Morning News putting Obama‘s job approval slightly higher than the long-time governor’s. Only forty percent of those surveyed approved of Perry. That is three percent fewer than those who approve of Obama’s job performance. In addition, over half feel Perry should not run for another term, although he still has three years left in the job. Three years? That should give him enough time to change things, or (hopefully) prepare for retirement from public life. 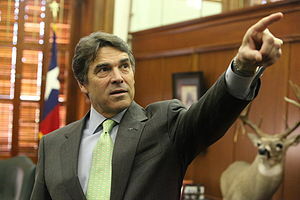 Rick Perry 2012: Texas governor less popular at home than Obama. ‹ PreviousDoes PolitiFact Do Its Job? Or Do They Do It Too Well? Interesting Will … however did you know that Ismaili mulsims DRINK AND SMOKE? (that’s who the hasheeshem were).And that KEY FOR US, and ASSIMILATION… they believe that when god wrote the Quran there was an apparent meaning and REAL MEANING.Get it?This means and they say it EXPLICITLY that it makes the Quran amenable to current meanings.It also means that they would be regarded as apostate, and ARE.They have been persecuted by other Muslims since the 7th centuryThat’s who Perry is apparently ‘friends’ with.Let’s size our brush carefully.I don’t find this one as questionable as the CAIR connected guy who Christie got involved with.Again, I have not made up my mind AT ALL w rgd to repub candidates.WIDE OPEN.